Boat window tint is beneficial much for the same reasons as automotive tint or commercial window tint with a few exceptions. Tinting your curved boat windows will assist the driver of the boat from any distractions caused by the sun rays while out on the water. With being on the water, experiencing a glare during the day is expected and can be prevented. This also provides protection for the internals on the boat. Curved window tinting requires a different technique to normal shaped window tinting such as shrinking techniques, which can look absolutely spectacular when done right. Protective tinting refers to the contents of your boat as well as in the case of an accident. Should you ever get in an accident with your boat, tinted windows will ensure that the glass shards from your windscreen does not reach the driver of the boat or guests, protecting passengers from serious injuries. By tinting your windows, your boat is protected from any smash and grab scenarios, keeping your valuables on your boat safe while parked in the dock. Everything on the inside of your boat will be hidden. Tinting your boats windows blocks up to 91% of infrared rays. This means that the internal controls as well as the interior of your boat will be protected from direct sunlight beating on your furnishings while out at sea and even standing in the dock. Your passengers will appreciate the cool interior as it will not heat up as much as a non-tinted boat would. Tinting the captain’s windscreen will result in less glare from the water as well as lessening eye fatigue caused by strained eyes. Outward vision will be improved for both the driver of the boat and the passengers. From the outside, your privacy is maintained ensuring that no one can see in while your guests get a crystal-clear view from the inside. Factors affecting the cost of your window tinting include the size of the windows, the number of windows, the type of design/film you choose for your tinting and whether or not any old tint needs to be removed. Purchasing the film yourself is inexpensive but you may run into some trouble when it comes to technique. Most importantly, you want it to add to the aesthetic of your boat and not detract from it. Because tinting curved boat windows is a little different to standard windows, you’ll want to go with a creditable company who is familiar in boat window tint as well as curved windows. 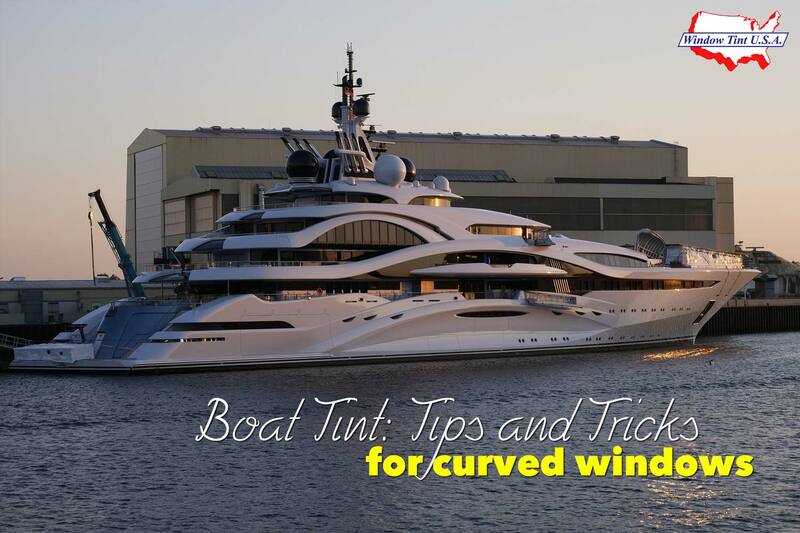 Boats with curved windows have irregular edges that make installing the tint tricky. Heat shaping is required in order to fit the shape of glass perfectly. A heat gun is used to shrink the excess film along the edges and smoothing it out with a microfiber cloth or a hard card. Something like a hair dryer to heat up the film will not get the film hot enough, which means DIY might not work in this case. Another disadvantage to DIY tinting of your curved windows is that you need to work fast and precisely. Pausing may result in shrinking the tint unevenly or burning the tint. You will also need to prevent any creasing while you’re doing this. Things can get a little tricky if you aren’t used to doing this on a daily basis. Professionals such as Window Tint USA do this on a regular basis and have the skills with boat tint required to complete the job flawlessly. Tinting your boats windows is as much of an investment for the longevity of your boats surfaces and cabin as well and provides a comfortable protection for guests. Don’t let glare and heat ruin your time on the water. Specially formulated marine window film enhances the look of your vessel.